Are We Really Going to Fish or Just Move to a New Cabin by the Lake? We just sold our Celebration Center. Now our church family meets at our home. We’re a house church. Our first meeting was last Sunday. God met us and we were all full of joy. We know God is doing something new in our midst and we have set our hearts on following. But . . .
We have also changed our heartset along with our change of meeting location, we decided not to be–as one brother put it–“a church service caught by a living room.” I don’t want that. And I’m grateful that the folks in the New Life family don’t want that either. We made decisions. We are making real changes. We prefer productive over active. I’m proud of the brothers and sisters I fellowship with. They want to catch fish, not just study fishing or sing about fishing. We’ve all done that for too long. We’re not the church that has it right. We respect and honor the other churches in our region who love Jesus and people too. All we’re doing is following the Lord where He is leading ANY church that is doing that will be not only busy, but productive with the fruit of the Kingdom. So . . . I’m sharing this important link, because I want to keep this truth before us and I want to reach out to other believers to do some serious soul-searching and then . . . TAKE ACTION! I hear the following video challenge loud and clear. QUESTION: Do you know a friend who needs to consider this challenge too? We’re in the very first stages of a transition. New Life Fellowship of Concord, NH was a traditional church that transitioned to a cell church. After ten years as a cell church, we just sold our building in town and are moving and morphing into a house church. We are not doing this intentionally. We’re simply following the Lord. The way we’re meeting has changed as much as the venue is now changing. We’re informal and relational. Actually, the transition began with the way we worshiped. We added a period of silent waiting upon the Lord immediately following our music worship. And from there, we felt that the Lord wanted us to be less ordered and open up for more involvement by the people. As we invited folks to share what they sensed the Lord doing, we began to see that He was changing our focus. Now we are hoping that we don’t just fall back on our earlier worship format. We don’t want to become–as one author wrote–“a church service captured by a living room.” We want to explore more fully anything that will draw us closer to our Father and to one another without compromising the Gospel or abandoning worship. But we sense our worship will change. And so will our outreach. I’m not sure how we will meet without a plan, but the Lord knows; and we’re willing to let Him lead. He is the Head of the church. We all agree that we’re teetering on the brink of the ministry of Jesus. People who need healing and deliverance are coming to us. We have always desired to have them see Jesus– “To Know Him and To Make Him Known.” We also know that in our age and culture, the only way to lead people to Jesus by demonstrating that He cares about their needs, their hurts, and pains. I had a seminary professor, J. Christy Wilson. He had been a missionary to the Muslims in Afghanistan for fifteen years. He said once in answer to a question I posed: “You will never win a Muslim with an argument. You will lose every time. But the way they come to Christ is when they see Him heal their children or loved ones. They are won through the manifest compassion of God. Allah cannot heal. Allah does not heal.” Only a power encounter or revelation of Christ will bring Muslims to Christ. I believe that’s true of not only that group but of many modern people groups who have abandoned what they consider dead religion. Unfortunately, they threw out the baby with the bathwater. Anyhow, I look forward to our first house church meeting this coming Sunday. Yes, we still meet every other Sunday and on off weeks, we meet on Saturday at barbecues to which we invite our friends and family who do not yet know Jesus. One week of outreach followed by one week of worship and prayer for those we love. That seems to be the pattern. We do not feel that we have the exclusive corner on how to do church right and everyone else is doing it wrong. We feel that every church has a ministry if they want one. They fulfill a purpose that is specifically theirs. We simply believe that this is where God is leading us. And because we love Jesus, we can do nothing better than to follow. Unless of course, we’d rather be a museum than a ministry. Not us. We’re in this for life . . . all the way. QUESTION: Wonder what God has for us as we abandon our old wineskin for a new one? I am small, but in this post, I have embraced a huge task. I seek to glorify another. My voice is not loud, but perhaps, because of the internet, it will be heard (if not believed). First, I hope to help redeem the term “Christian”–which I would define as “a regenerate (born from the Father) disciple of Christ,” so that we can once again use it free from historic baggage and pejorative connotations. Second, I hope to clearly portray a true Christian. The only way to do that is to renounce Christianity’s historic counterpart–Churchianity. “All those who say they know Jesus but do not walk as he walked are liars (and we know who the father of lies is) and the truth is not in them.” —First Epistle of John, Chapter 2, verses 4-7. No believer can, by the leading of the Holy Spirit of God, deny the character of Christ by word or deed. Yet that’s what much of historic “Christianity” (which I call “Churchianity” from here forward) did. By their actions Churchianity denied Christ and even put to death true believers and followers of Jesus, because the believers would not relent from their pure faith in Christ to follow dead forms and traditions of men. These dead forms and traditions (“religion”) were kept alive by evil men. Often, those who could afford to give the biggest estates and most money to the church hierarchy received titles and position in the church. These abuses are well documented in church history. Jesus warned that wolves would come in among the flock and ravage it FROM INSIDE. These are men who grasp power, riches, notoriety, and influence–all of which true disciples of Jesus would renounce, like their Master. These parasites were animated by religious flesh and were themselves the guardians of demonic strongholds. Unfortunately, Churchianity continues to be led by these unregenerate men. They have no loyalty to Jesus but use his name for their purposes, to consolidate their institutions, introduce false, heretical doctrines of demons, and lord it over the vulnerable and gullible. They create a culture of fear and shame to hold people in line. 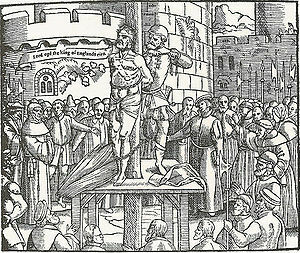 A man of a particular “Christian” sect once told me that if the Inquisitions had succeeded, and were still in effect, he would delight to give the order to put me to death. He told me this with vehement anger and bulging veins as he shouted in my face that because I believed what Jesus said about having to be spiritually born from God that I was a heretic. This man would have made a good church leader in the middle ages. But he would not have been a good Christian. He is the stuff religious Churchianity is made of. See why, in a previous post, I despise religion? Simply read the Book of Martyrs and see. Read about the voices of the radical reformation that stood against this pagan form of Christianity. That form of religion is what has prevented many millions from turning to Christ to find his arms open to receive and love them. Only the final judgment of God will put an end to “religion,” but I’ll be happy to see that Day with my Savior and Father. As the Word of God teaches, we who know and love Him will judge fallen angels and remand the spirits behind religion to the Lake of Fire. What a day of rejoicing that will be, when people are no longer troubled by Satan’s host. And Churchianity dies. All that remains is this last word: Any “Christianity” that does not walk as Jesus walked is a counterfeit and a blasphemy against God the Father and Jesus our Lord. And how did Jesus walk? In humility and obedience to the Father. Loving his brothers and doing the works of the Father. Sharing the Beautiful News of the Royal Reign of God. This is Christianity, the only one God recognizes.